Earn $4.29 in VIP credit (429 points)What's This? Put in the hard miles with the Panaracer RiBMo (Ride Bicycle More). 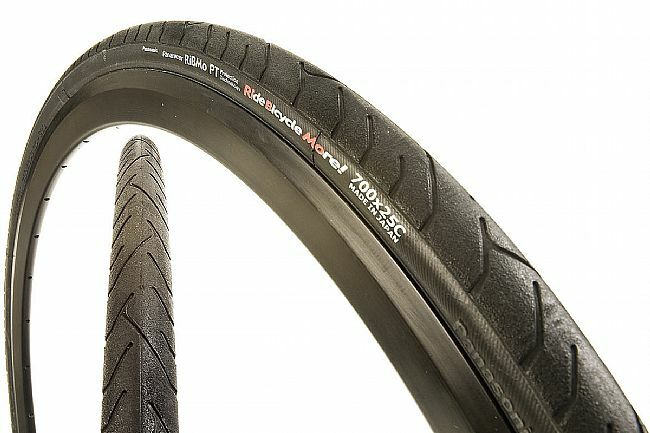 A step up in durability from the popular T-Serv model, the RiBMo features the MileCruncher 800D rubber compound and ProTex anti-puncture barrier for maximum puncture resistance and superior tread life at a slightly increased weight. An excellent option for touring and commuting when a low weight is still an important priority. All contact tread. Folding bead keeps the weight down. 700c x 25mm (25-622 ISO; 115 PSI; 330 grams).